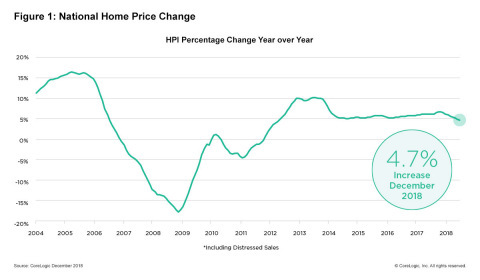 CoreLogic HPI Forecasts ™ are based on a two-stage, error-correction econometric model that combines the equilibrium home price — as a function of real disposable income per capita—with short-run fluctuations caused by market momentum, mean-reversion, and exogenous economic shocks like changes in the unemployment rate. With a 30-year forecast horizon, CoreLogic HPI Forecasts project CoreLogic HPI levels for two tiers — “Single-Family Combined” (both attached and detached) and “Single-Family Combined Excluding Distressed Sales.” As a companion to the CoreLogic HPI Forecasts, Stress-Testing Scenarios align with Comprehensive Capital Analysis and Review (CCAR) national scenarios to project five years of home prices under baseline, adverse and severely adverse scenarios at state, Core Based Statistical Area (CBSA) and ZIP Code levels. The forecast accuracy represents a 95-percent statistical confidence interval with a +/- 2 percent margin of error for the index.